Travel has become a lot more convenient, quick, and comfortable in recent years. Moreover, it has become a lot more expensive. You may be saying to yourself, “Wait, what about all the low-cost airlines that promise to get me halfway across the world for only $300?”. Yes, those airlines do exist, but not without a catch. Read on as we explain the changes going on within the airline industry, and how you can avoid the many charges, you will likely incur on your next trip. For a while, there were only major airlines such as American Airlines, British Airways, and Delta controlling the travel space. These airlines are not only reputable and popular, but they’re extremely powerful. So powerful in fact, that they can make their own rules and change their terms whenever they want to. With so much power, these major airlines are in a way able to force travelers to pay fees, which they never had to pay before. Take Alaska Airlines for example. They’re a massive airline that makes millions annually. It wasn’t before long that the airline changed its allowed baggage sizes to make some more revenue. You can’t blame them – all their competitors are doing it. The airline announced in a statement released by its CEO that it’s shrinking passengers’ carry-on allowance by 32%. The worst part? If your bag is over the allotted carry-on size, you will be required to pay the full baggage prices. The conglomerates have their power, but things changed when low-cost airlines like WOW, Ryanair, and Spirit came into the picture. These low-cost airlines have carved out their market, as there is definitely a need for more affordable travel solutions. To compete with the low-cost airlines, the major conglomerates dropped their fights rates. This all sounds good and well, but if you’re a frequent traveler, you see through the airlines’ tricks. In the race for market share, both major airlines and low-cost airlines charge travelers for pretty much anything over the basic flight cost. You can pay a small amount to get you up in the air, but if you want a pleasant travel experience, you’ll need to pay. Airlines today are charging for everything – snacks, extra legroom, headphones, baggage, and more! Here’s where stuff gets serious. Airlines may charge for extra snacks or headphones, but where they really get you is with their exorbitant baggage fees. How many times have you gone on vacation and wound up finding incredible shopping centers and malls that you just couldn’t resist stopping into a picking a few things up from? Yes. We know how it goes – it happens to everyone. To avoid baggage fees, you have a few options, some better than others. Your first option is to not fly at all. Those mini-pretzels are delicious and seeing different places or visiting family is fun, but it’s pricey! Don’t worry; we’re only joking. That’s no way to avoid the fees. What you can do is fly with no bags, a popular option for 1-day business travelers. But hey, that’s not realistic either, and who usually flies somewhere for the day without sleeping over for at least one night? Some realistic solutions include bringing along a duffle bag, which can be used as a carry-on or a suitcase. Though it’s a viable option, many people avoid duffle bags because they need to be carried over your back. They are also made out of fabric, which isn’t ideal for transporting valuable or fragile items when traveling. Sore back plus broken souvenirs… less than ideal. To avoid fees, you can try to only fly with an airline that doesn’t charge for baggage. This is a great option, just keep an eye out because many times the ticket will have baggage fees built in. What makes the most sense is flying smart using our Rollux expandable suitcase. It’s the ultimate solution that combines everything you may need in a travel bag into one sleek and smooth looking suitcase. The best part? You can avoid baggage fees altogether. Rollux can be used as a carry-on or expanded into a full-size suitcase. Say you’re traveling on an airline that charges for bags and you’re going to visit your baby cousins. You can fly there with your full-size suitcase (you would have to pay for baggage), but on the way back, once you’ve unloaded your gifts, you can reduce the size of your Rollux and take it with you on your flight and stored above your seat. 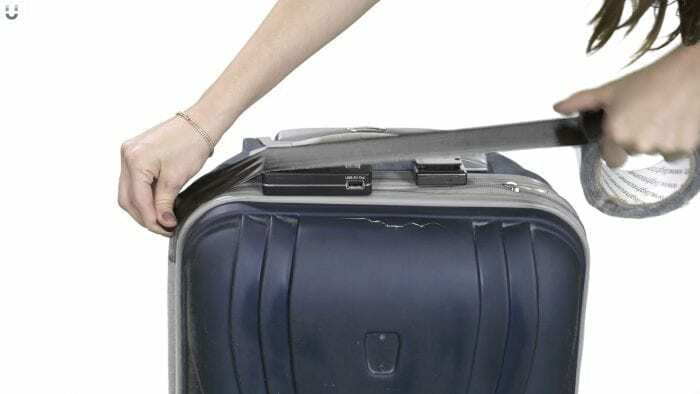 Say you’re on your vacation with your Rollux and wind up buying gifts for family members, just expand your bag, and you’ve completely eliminated the need to buy a new suitcase for the flight home! When traveling, it’s your right to travel how you want to. You deserve the freedom and flexibility to choose what to pay for, when. You also deserve the freedom to take whatever size bag you want or need without having to be contained to the bag’s size. With Rollux, you can take a carry-on and turn it into a full-size suitcase whenever you need to. Just one purchase of our Rollux luggage and you will save yourself hundreds in baggage fees on future travels!